So, you’ve braised some kale. And you need a meal to go around it. Or you have some leftovers. Here are ways to use braised kale in dishes. Yep, braised kale piled on toast, maybe with a little squash puree, makes a lovely lunch. Toss hot pasta and pasta water with braised kale and a little crème fraîche or almond butter (seriously), and you’ve got dinner. Add the greens to Asian soups or stir-fried noodle dishes, like pad Thai. Top homemade pizza with warm braised kale for the last minute or so of baking. Or stuff braised kale and cheese in small half-moons of pizza dough and bake to make mini calzones. Smear vegetarian refried beans on tortillas, then top with braised kale, sliced avocado and raw radishes and you’ve got a delightful vegan taco. For a more ambitious project, wrap kale with tamale dough followed by corn husks and steam. Spread out braised kale in a baking dish, top with cheese and croutons. Or toss kale with bread cubes and custard and bake into a luscious pudding. Even the kale haters will love it. 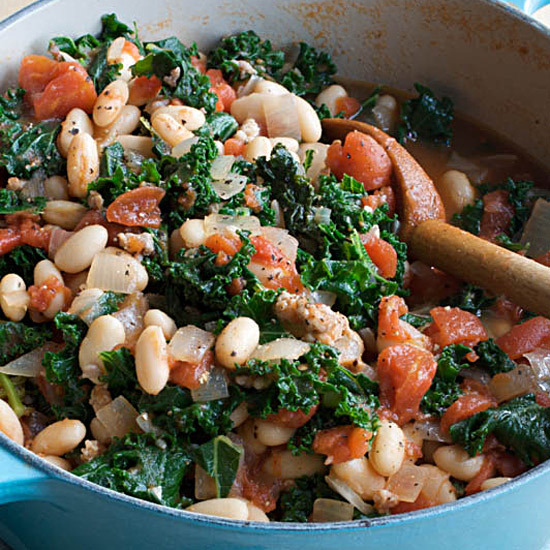 To transform braised kale into a heartier dish, add cooked beans, mashing them slightly to thicken the juices. Mix the braised kale with lots of beaten eggs and cook in a nonstick skillet until nearly set, then sprinkle with cheese and broil. Mound braised kale into par-baked mushroom caps, then top with cheese and bake. Use braised kale in place of spinach when stuffing a pork loin or a chicken breast.